For basic planting and growing information, go to www.daylilies.org, which is the web site for the American Hemerocallis Society, an International Daylily Society. Click on the item "Frequently Asked Questions." 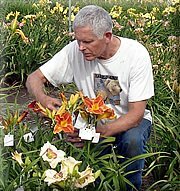 Questions on how to plant and grow daylilies are included in the list. Click on the question which is closest to what you need to know. We think you will find the information helpful.